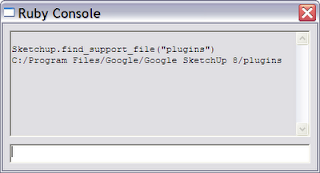 How to download and install Google Sketchup Plugins. Beginning with version 4, SketchUp has shipped with an embedded Ruby-language interpreter allowing anyone to write Ruby scripts which can automate, extend, and customize SketchUp. Plugins can save time, and allow SketchUp modelers to do things that are difficult to achieve otherwise. 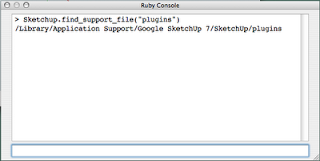 There is no central place to find SketchUp plugins. Many people have contributed plugins, which are hosted at sites across the Internet. SketchUcation Plugins Index – is home to an active developer community. Smustard.com – the site of the original plugins guys, Todd and Rick offering many free and paid plugins, support forum, and custom plugins services. Ruby Library Depot – Didier Bur’s plugins archive. Many older plugins not available elsewhere. In theory, downloading any file should be as easy as left-clicking on its link. In my experience, it is not always that easy. The most reliable way to download plugins to right-click on their link, then select “Save link as” or “Save Target as” (depending on your browser.) You may be prompted by the browser for a location to which to save the file. Save the file to a convenient location. 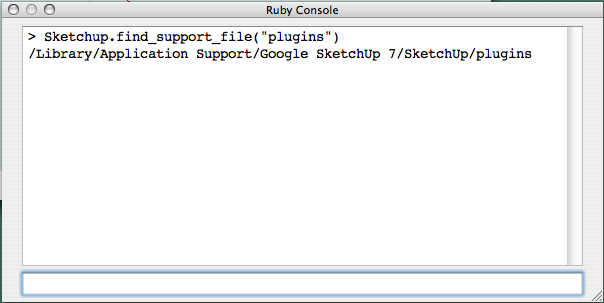 For single-file Ruby (.rb) plugins, installing just means moving the file to SketchUp’s Plugins folder. There seem to be more problems when the plugin is a .zip archive which consists of multiple files. The important point is that folders and sub-folders within the .zip archive must be preserved when extracting. When using WinZip, for example, there is an option to “use folders” which must be checked in order to preserve the folders when extracted. In a case like this, both the .rb file and its associated folder would be put in the Plugins folder. There may also be further sub-folders under the main folder – again, the key is that all folders and sub-folders be kept when extracting from the .zip archive. The location of the Plugins folder in SketchUp is dependent on the version of SketchUp installed, and the operating system in use. This is the location to which you will move or copy the plugin files; whether they be a single .rb file, or a unzipped file and folder. Once the file(s) are moved, you will need to close then start SketchUp again. Where Are The Plugins In SketchUp? In short, plugins can appear in any of several places. Plugins can use any of the top-level menus: File, Edit, View, Camera, Draw, Tools, Windows, Plugins, and Help. Plugins can create sub-menus in any of the aforementioned top-level menus. Plugins can also create right-click, or context menus that only appear when the appropriate type of entities are right-clicked using the mouse. Plugins can also create Toolbars in which case the plugin’s Toolbar name would be visible in the View/Toolbars menu. Finally, plugins may use the Extension feature. Extensions can be enabled or disabled when first installed, so you should check the Preferences/Extensions dialog window for disabled extensions. How Can I Find Out Exactly Where A Plugin Will Appear? Open the plugin file in a text editor (such as Notepad.exe), and look for code concerning the creation of menus and toolbars. Typically this code occurs near the top, or more likely at the bottom of a script. Corrections and feedback on this article are appreciated. This entry was posted in SketchUp and tagged Google, Plugin, SketchUp on September 4, 2011 by enddl22. Inverting zoom in and out direction with mouse wheel scroll in Solidworks. 오토캐드를 사용하시는 분들께서 솔리드웍스를 사용하실 때 많이 불편해 하시는 것 중 하나가 마우스 휠을 이용한 줌인 줌아웃 입니다. 왜냐하면 방향이 반대 방향이기 때문입니다. 그래서 마우스 휠 줌인 줌아웃 방향을 바꾸는 방법을 소개할까 합니다. 메뉴에서 도구-옵션-시스템 옵션-뷰-마우스 휠 확대 방향 바꾸기 를 선택하여 설정하여 주시면 줌인 줌아웃 방향을 변경하실 수 있습니다. This entry was posted in CAD, Uncategorized and tagged CAD on May 19, 2011 by enddl22.